functioned plotter and navigation tool. Since we last took a look at navigation apps in February 2012 the number of them has increased tenfold, helped partly by the recent release of UKHO data in Vector chart format. When looking to use navigation apps, don’t take the advertised price as read: some apps are free to download, but then require in-app purchases of the relevant charting. Others are all-inclusive, while some allow you to use charts of your choice downloaded from elsewhere – so check you know what you’re getting. Users of iPad and Android seem to divide into two camps. There are more apps available for iPad, but Android tablets are available more cheaply – a consideration if you’ll be using it near water. 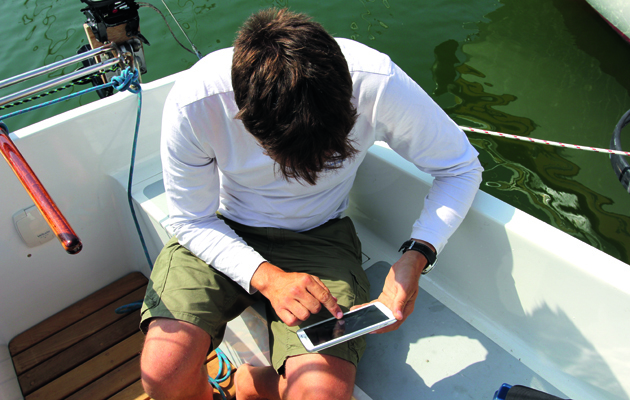 After all, most tablets aren’t designed for the rough-and-tumble of life on board a boat. For one thing, most are not waterproof (the exception being the Sony Xperia Z range, which is waterproof and ruggedised), and their screens aren’t optimised for viewing in sunlight. But given a good waterproof case – and a fall-back system if the tablet fails – they are extremely useful to have on board. There is a bewildering array of products out there. If you’re using an iPad you’ll need to get one with 3G capability – WiFi-only models come without the internal GPS. Non-GPS iPads can be converted with a plug-in GPS antenna, but this makes it tricky to fit inside a waterproof case. There are even more options when it comes to Android tablets. We used a Samsung Galaxy Tab 3, bought from Tesco for £139. Older models are available from around £80, reconditioned. You can get simple, cheap tablets like Tesco’s own-brand Hudl from around £100 new, all the way up to the waterproof Xperia range at around £400. iPads cost from around £349 for an older- generation iPad 2 with GPS. Raster charts are simply scanned versions of paper charts, overlaying position, routes and waypoints. Vector charts are made up from a number of layers and are much more adaptable, with adjustable levels of detail and interactive features like tidal information. Most tablets can be charged from a 12V cigarette socket, although for the iPad in particular you’ll need a socket capable of outputting 2.1A. to look a bit harder to find a suitable waterproof case for your Android – but they are out there. We loaded the apps onto their relevant tablets – an iPad 2 for the Apple apps and a Samsung Galaxy Tab 3 for the Android apps, looking at how easy and intuitive installation was, as well as considering the ease and cost involved in downloading and installing the cartography for each app. 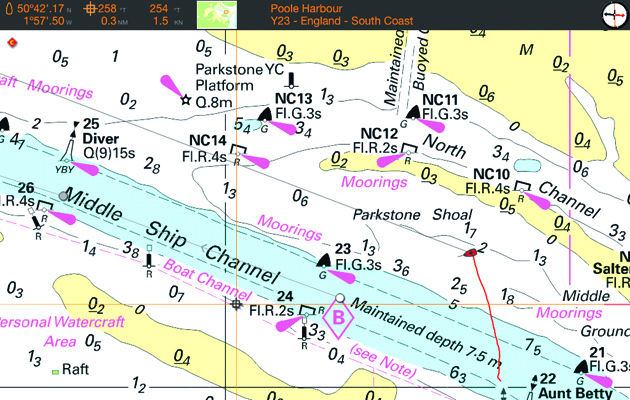 This done, we planned a route from the PBO Project Boat’s mooring off East Dorset Sailing Club in Poole Harbour around to the Upper Wych channel and Shipstal Point. This takes in the shipping channel as well as a narrow, marked swatchway with frequent changes of direction and numerous marks, which would give each app a good trial. With the route planned we cast Hantu Biru off the mooring and sailed slowly to follow our route on each of the apps. We had bright sunlight, which reduced the screens’ visibility but proved useful to show up how well the differing cartography and colours could be seen in the sunshine. We looked at how useful each was as a plotter, how intuitive it was to use and how well it followed routes and waypoints, dealt with positions and detail levels. As we nosed up the narrow channel to Shipstal Point we evaluated the tidal data available, before dropping the hook and evaluating each app’s usefulness on board. AquaMap UK can be downloaded straight from the app store, and with charts covering the whole of the UK and Ireland for £11.99 is among the cheapest of all we tested. To view the charts offline you must select a ‘tile’ that covers the area you wish to download, which was quick and easy. AquaMaps’ Vector charts are brightly coloured with oversized icons and large depth figures. These are fine when zoomed in, but at low levels of zoom make the chart almost undecipherable. Routes are easy to add via a long press on your desired location and selecting ‘add to route’. Under way, there was a useful heading vector. GPS data – COG, SOG distance and time – is displayed on a grey panel at the bottom of the screen, with route information on a matching panel at the top of the screen, and you can cycle through the route by tapping the next mark in the panel. 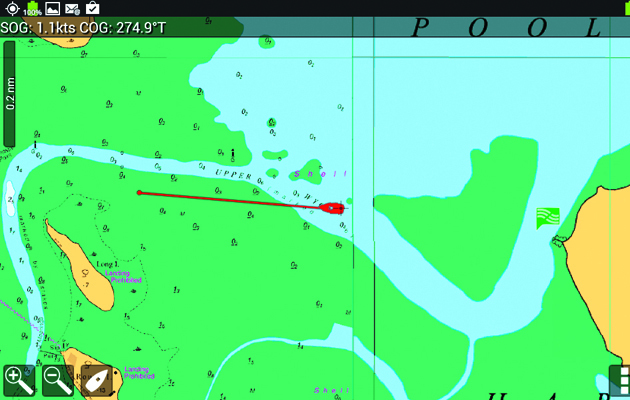 Position data can be accessed by tapping the boat’s location icon. Buoyage information and light characteristics are accessed by a single tap on the mark of your choice. In the bright sunlight, the app’s gaudy colour scheme was somewhat hard to read, although the features certainly stood out. Garmin’s offering is a smart-looking app that replicates the look of their stand-alone plotters. The interface looks limited at first but is easy to use once you know how. Installation was easy, with charts available via an in-app purchase: they are more expensive than most, although the package does cover the British Isles and the mainland from Amsterdam to Monaco, as well as the north-west coast of Africa and the Azores. Inputting a route was simple, with few taps on the screen. A useful route overview appears at the top of the screen. Tapping on a chart feature – a light, for instance – prompts a circular menu wheel to appear which lets you view the available data and characteristics of the item, as well as any other data available, and the option to add the mark as waypoint or as part of a route. Tidal data is available via ‘t’ and ‘c’ icons, which give you tidal heights and flow graphs for a given time and date. GRIB files can be overlaid over the chart via an active data connection. The charts weren’t as detailed as the iSailor or Navionics at high zooms, and sometimes took a while to reload when panning and zooming, but were clear. The colours were muted in direct sunlight, but were still readable. 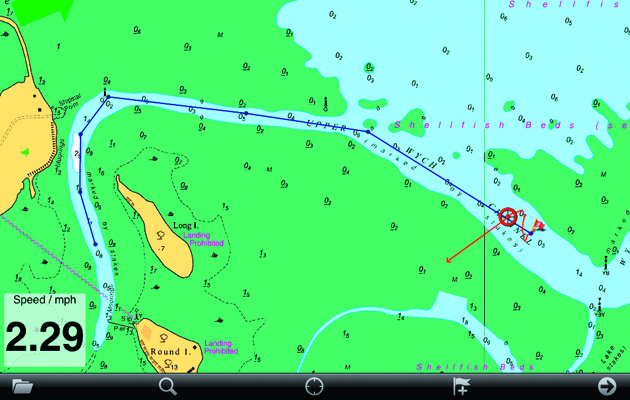 The GPS Nautical Chart app uses UKHO raster charts, overlaid on an Open StreetMap basemap. high levels of zoom when the large-scale chart appeared, but this was pixellated. That aside, inputting a route was simple: a matter of selecting ‘create route’ and then tapping on the chart to create the route. A range and bearing line helps you position the route points on the chart. Selecting ‘autofollow’ let the app follow the route, which – to our initial surprise – included a computerised voice which instructed us to ‘get back on route’! 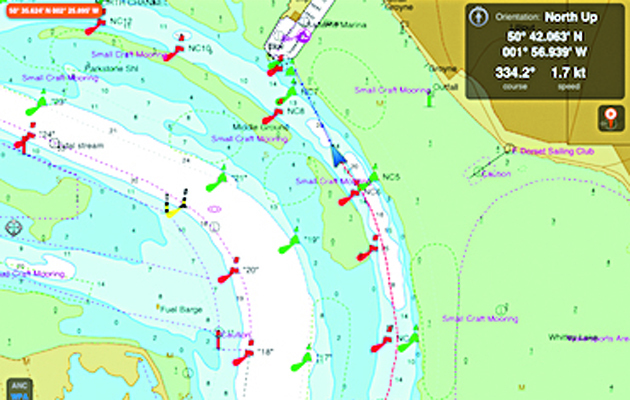 Passage information can be usefully displayed on each leg of the planned route.Basic tidal information is available, displaying tide times and heights in local time for two days for standard ports, which you can select from a list or an interactive map. You can view your vessel’s position in the top bar, and SOG and COG data is displayed when under way and following routes. 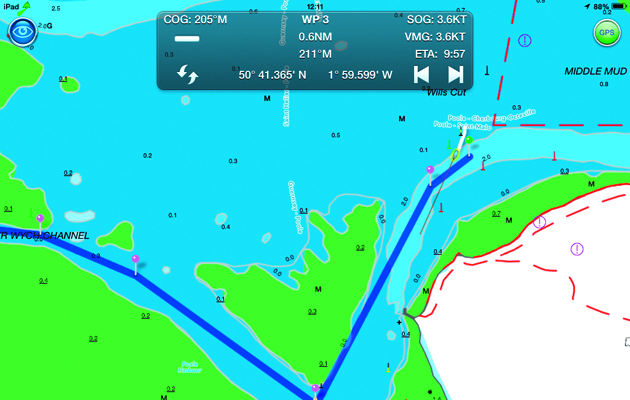 iNavX accepts a variety of charts – for the UK this is the same Navionics cartography as the Navionics HD app. Installation is a little more long-winded than others – the app requires a separate registration to X-Traverse.com to get the charts. While the charts may be the same as Navionics’ App, iNavX offers much more functionality than the Navionics app as a chart plotter. It can overlay GRIB files and display NMEA and AIS data. The waypoint and route functions are more akin to those on a proper plotter, with lists of waypoints, but this does mean that putting in a route involves placing your waypoints, naming them and then adding it to a route, which is more time-consuming than some other apps. Nonetheless, when following a route the app was very effective, with a useful and clear instrument panel. Charts were fast to redraw when zooming and panning. Tidal data is readily available and well presented. This app has a lot of potential, and is useful as part of a fully-featured onboard system, but it’s not as simple and intuitive as some of the others on test. 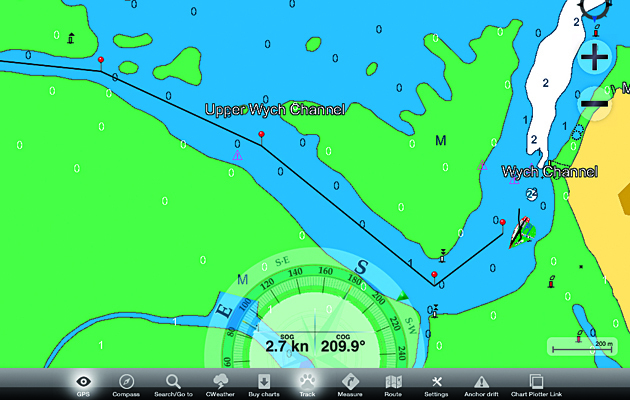 The Marine Navigator app can be used with charts of your choice. 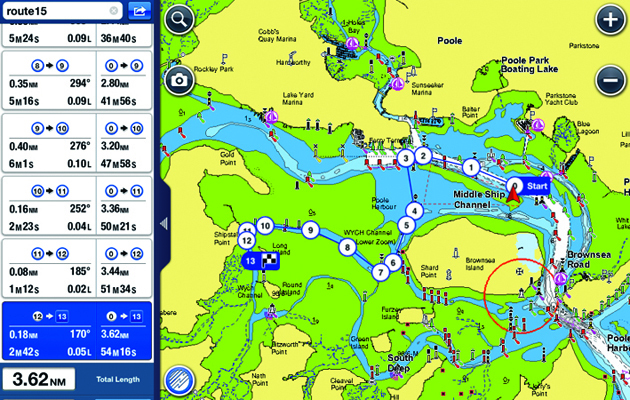 We used Admiralty raster charts from the Isle of Wight-based company Visitmyharbour.com. Installation is straightforward, the easiest way being via a DVD and PC, from which you can load the charts you require. Inputting a route was simple: it’s done via a menu which offered the choice to make a new route, and then ‘append’ or ‘prepend’ a mark to the route via a long press on the desired position. When the route is being followed, data appears in a panel at the top left of the screen. One useful feature is a hand-bearing compass display across the top of the screen. This was the only app that doesn’t use the ‘pinch to zoom’ motion across the screen – there are zoom-in and zoom-out buttons to tap instead. 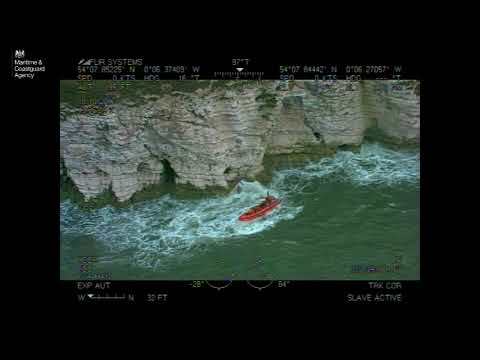 It’s also the only one to have a Man Overboard function, accessible via a long press on the screen. The app was effective at switching automatically between charts as you zoom in and out, or you can select the relevant chart from a list. It’s a good, basic app at a low price, and the flexibility offered by the chart options means you have a number of options. follow it as we beat along the narrow channel. There is no interactive tidal data, but there are icons on the chart with information on anchorages, slipways and marinas. A ‘measure’ tool is available, starting from the centre of the chart. It took us a while to get used to this app, but it was our favourite Android raster app once we had. Digital Yacht’s Navlink UK app is made by the same developer as SeaNav UK, but it is optimised for use with the former’s instruments and electronics. We tried both apps, which offer the new Admiralty vector charts overlaid onto Apple maps as a basemap. The bright colours worked well in direct sunlight, and installing charts was simple by scrolling to the desired area when connected to WiFi and waiting for the charts to load. In use, the charts were effective, with a quick redraw rate. Adding a route was easy and fast. You can enter a waypoint by tapping on its position on the chart or by entering its Lat/Long. A ruler measures bearing and distance from the boat’s position by default, or can be moved around to act as a pair of dividers elsewhere. Under way, a vector line shows the course over ground, and a useful route panel shows the relevant data. A single tap on a feature such as a channel marker gives its description, and a further tap gives you its light characteristics. You can quickly get your latitude and longitude via a press of the sailing boat icon. 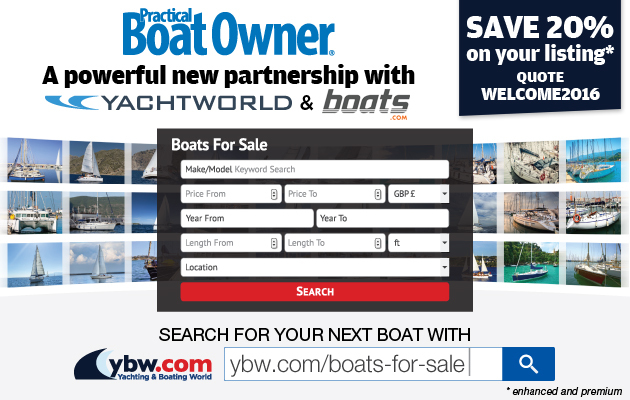 You can set up a quick ‘goto’ by tapping the chart and selecting ‘sail to here’. Tidal information can be selected for any area, but needs to be downloaded first. Live weather buoy information can be viewed via an active internet connection. MaxSea’s TimeZero app is free to download, but the charts must be purchased in-app. They are Admiralty raster charts, but the app itself makes handling them a delight – it’s by far the nicest raster chart app that we tried. Some of the other apps we were testing struggled to choose the correct chart for the level of zoom, but this app selected the correct level seamlessly. 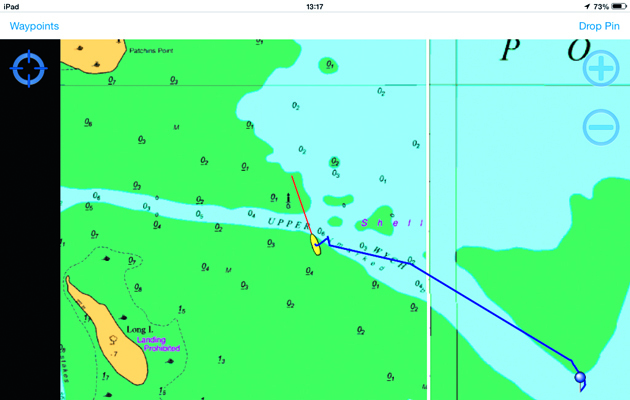 Inputting a route was simple, with the page centring on each new waypoint as you enter it, which made plotting a course along our narrow buoyed channel easy and fast. The user interface is very user-friendly and intuitive, with a customisable data display on the left-hand side which displays SOG, COG and any other useful data. The app was one of the better ones when it came to following the route. Tidal data was easily accessible by tapping ‘data’ on the info panel, where it displays a tide height graph and weather forecast for your chosen location. Tidal height indicators are overlaid on the chart – a visual ‘battery’- type guide to the current height. Tidal flow is also displayed, although you can’t view future tidal stream data. A tap on each waypoint reveals its position and allows for editing and a ‘goto’ function, whereupon the relevant information appears in the screen. Available on both iPad and Android, the Memory Map app is designed to accept cartography from both marine and onshore providers like Ordnance Survey. Once downloaded, you can load the charts via the ‘Digital Map Shop’. Once installed, the charts were easy to access and change by pressing the ‘folder’ symbol and selecting a chart from the text list. The charts automatically changed as the zoom level altered, although not as seamlessly as the MaxSea or Imray apps we tested. Plotting a route was as easy as tapping each point on the chart. Once enabled, and under way, the app followed the route successfully, displaying an arrow to get us back on course. 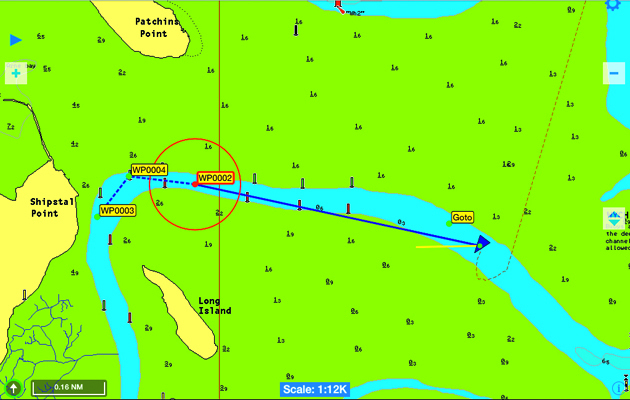 Waypoints were equally easy to place, edit and move on the chart via a drop-down menu. A useful vector displayed our heading on the chart. A quick swipe down the page displayed the information panel, with all the data you could want in a customisable interface. A half-swipe gave you a limited view of the data. Speed was displayed on the screen at all times. There is no interactive tidal data available through this app. 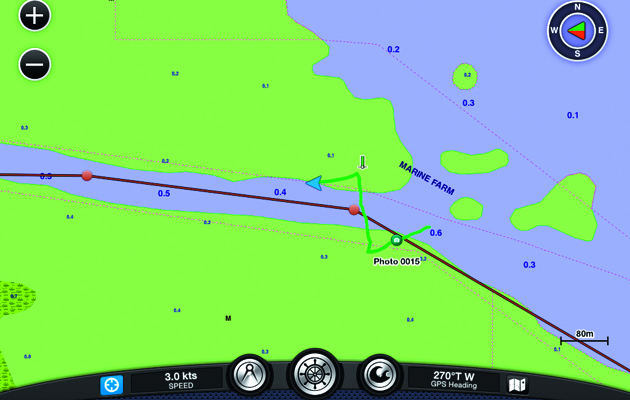 SailTimer’s App is designed for use with Admiralty charts, available via an in-app purchase. They are designed to be used with SailTimer’s wireless windvane and anemometer, which feeds wind data to the app. This is then used to calculate upwind tacking angles and ‘TTD’ or ‘Tacking Time to Destination’ – a feature all the other plotters we tested ignored. We didn’t have a vane to connect up to, so we entered the wind information via the ‘input’ button instead. Waypoints are input by tapping ‘drop pin’ and then moving this to your required location and tapping ‘set waypoint’. Once set, a tap on the pin gives tacking distance and time if available. A green vector line gives the optimum tack for your destination, while a red vector shows your current course over ground. Entering the wind data manually wasn’t as effective as the amenometer would have been, but gave an indication of the potential of the app. Position is available by tapping ‘waypoint’ and viewing ‘current’. Tacking angles aside, the app’s functionality is very limited. It won’t follow a route, and goto functions when not beating are sparse. However, the upwind calculations could save you some time on your next long beat. 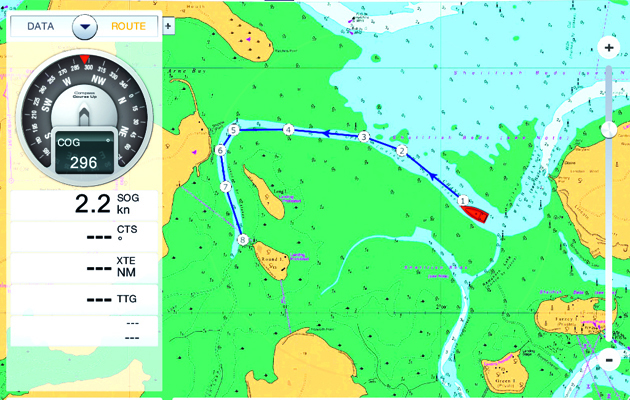 Imray’s marine raster charts appear just as their popular paper charts do, with the same familiar colour scheme. This showed up better in direct sunlight than the UKHO equivalent raster charts. most other raster apps tested. Inputting a route was simple and effective, as was following the route. We especially liked the arrows on the route, useful at a glance and the only app to do this. Your vessel’s position is displayed in the top bar, although the data – presented along with waypoint bearing and range in orange text on a black background – was hard to see in direct sunlight. AIS and NMEA data can be overlaid if you have a wireless feed from your boat’s instruments. Interactive tidal curves are available by tapping a ‘wave’ button, although these are by default for today only – you must purchase the Imray Tides Planner app to gain this function. Two distance rulers are available. Jeppesen, the company behind C-Map, produces its app for both iPad and Android. The app was free, and the charts could be purchased in-app. These vector charts are different in appearance to the other vector charts, and we found the colours harder to see on the tablets’ non-sunlight-optimised screens. Adding a route was simple enough, although we found that the zoom levels were irritating on both iPad and Android. The level of detail was only useful when zoomed well in – at a route-planning stage there were no marks or soundings, meaning that you either had to plan the route at high zoom or zoom out and guess, amending the waypoints at a higher zoom later on. Under way, the app was effective, with a useful compass rose and data panel at the bottom of the screen. You can set up a quick ‘goto’ by tapping the screen and selecting ‘map info’ and then ‘goto’. You could easily find your position by clicking ‘compass’. Tide height stations were available by tapping on the ‘T’ symbols, while tidal flow arrows are displayed all over the map. 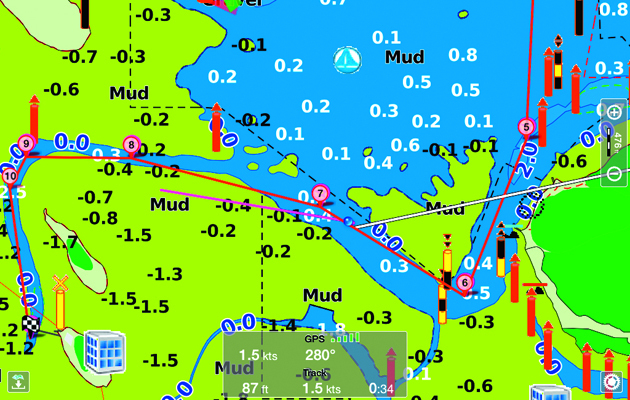 However, unlike the Navionics app these only display what the tide is doing at the present time – it doesn’t allow you to look at future tidal flows. Transas iSailor has a clear and intuitive interface. Its charts are available in smaller areas than others on test, and are therefore more expensive if you plan to sail out of your usual area. However, if you tend to sail only in one area then £17.49 for a full folio isn’t at all bad. The charts themselves use standard Admiralty colours, which were a little pale in direct sunlight, but stood out well nonetheless. The app is simplicity itself to use. A pull-out panel on the right- hand side of the display gives options – a data screen, route module, compass rose, find ship and settings are available. Inputting a route is easy, with a tap on the chart and a ‘+’ to accept the waypoint, before giving you a range/bearing line from the last to the next route point, which is useful. You also get the option to reverse the route, and can see the route in overview. A simple ‘goto’ can be set up by tapping on the chart and selecting the crosshair symbol, and under way passage data can be viewed on the panel to the right. Light characteristics and other information can be viewed by tapping the ‘i’ that appears when you tap on the landmark in question. A measure function is available. There is no live tidal data, which is a shame – if it was included the app would be pretty near perfect. All of these apps will allow you to use your tablet for navigation to some extent, but some were much better thought out than others. The choice between raster and vector charts is up to you, but we found vector charts to be our preferred choice on both Apple and Android tablets thanks to the charts’ detail and customisable and intuitive user interfaces. 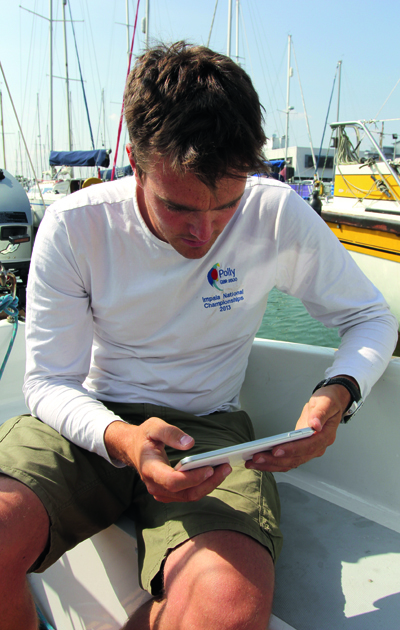 Our two favourites on iPad were Navionics HD for its ease of use, excellent cartography and simple, pared-down interface, and, close behind, Transas iSailor, which had more navigation features than Navionics and was more user- friendly, although it lacked tidal data. Digital Yacht’s NavLink UK (also sold as SeaNav UK) deserves an honourable mention thanks to its interface and well-presented charts. Maxsea’s TimeZero was our choice of the iPad raster chart apps, with a brilliant interface. 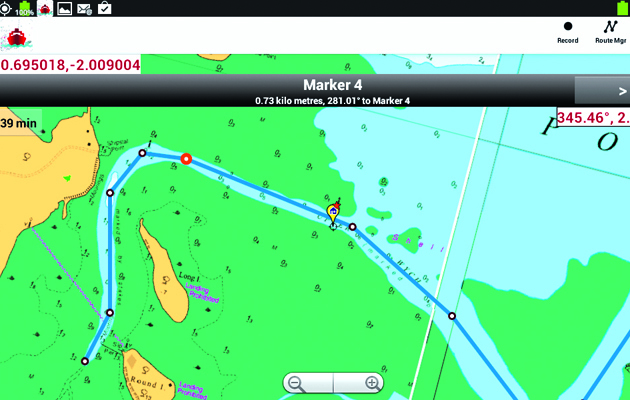 There are fewer options available for Android tablet users, but Navionics would still be our first choice, especially now that the extra Nav Module is available on Android. Memory Map was also a good performer, intuitive to use, and was our preferred raster chart app on Android, although MX Mariner deserves a mention thanks to its low cost. So, would we use these apps for genuine navigation? The answer is a resounding ‘yes’. The battery life and non-marinised nature of a tablet means you’d be mad not to have a proper marine GPS on board too but, with a failsafe, a tablet is a great way to get a plotter in your cockpit on a budget.